Photograph by Eric Piasecki for ELLE DECOR, featured in March 2015 issue. A recent issue of Elle Decor featured a beautiful project from Jan Showers. As you know from reading, Jan is one of my absolute favorites when it comes to making interiors look positively gorgeous and timeless but still fresh and exciting. 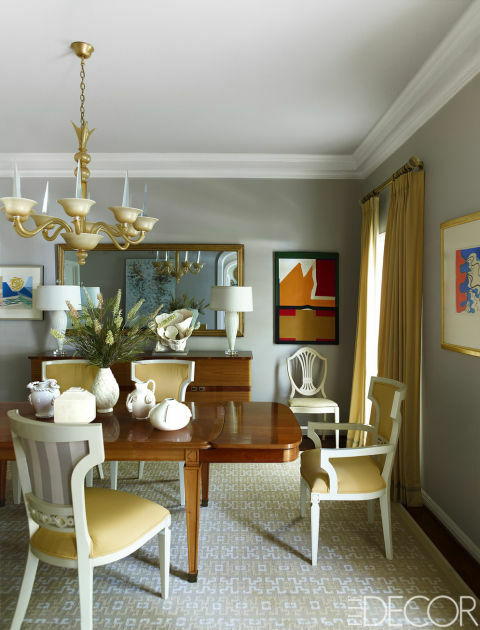 It's a delicate dance, but the gorgeous blonde Texas designer seems perfectly suited for creative luminous interiors that balance glamour and sumptuous comfort. This project, however, posed an unusual challenge: the client was her very own daughter Susanna. Fascinated by the idea of family dynamics and the normal client-designer tango, I reached out to Jan to ask about the project as well as tap into her glorious wisdom on all things beauty, style and design. I loved the Elle Decor feature about you and your daughter Susanna working together to freshen up her family home in Houston. It’s clear that you both have great appreciation for one another and the collaborative nature of residential design. 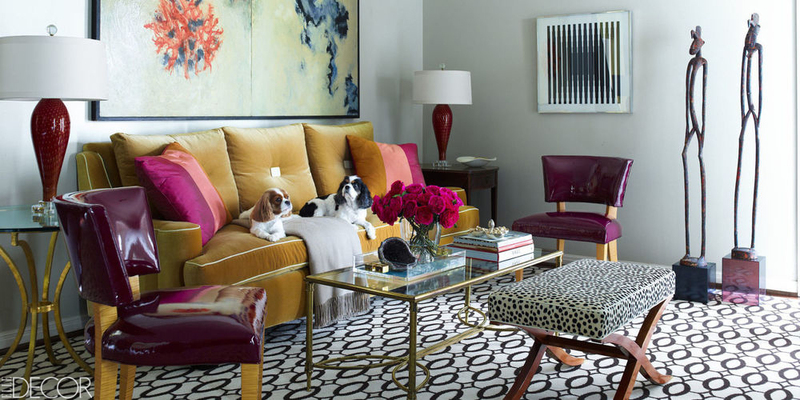 She really embraced the strong influence of color and you honored her personal attachment to many furnishings and special pieces. How was this dynamic different from the normal give and take process with other clients? It was actually very similar---we always try to incorporate pieces that have special meaning to clients and certainly colors that are complimentary to the clients or the art. I suppose that it could have been different in that Susanna and i certainly speak the same design language (at least 95% of the time). Often, spectacular results come from happy accidents. Was there a particular area or feature of the Moldawer redesign that resulted in a “wow moment" due to a mutual compromise where each of you had to “bend” a little? This is a great question! Because I love happy accidents. I honestly cannot remember one on this project---we thought everything through so completely---Susanna is very detailed and knows what she wants. Susanna, like you, has a tremendous respect for family heirlooms and antiques. When did you first discover your passion for furnishings with history? When I was in my early teens---i most fortunately had a mother and grandmother who both had a great eye and amazing taste. How has that influenced your work? I go to Paris once or twice a year to buy antiques and have for the past 20 years. Before that, I was going to New Orleans, New York and LA to buy with occasional trips to Paris. I am so inspired by unusual pieces, particularly those with a history. Amazingly, I've never seen a Jan Showers project that looks dated. Your timeless style is nothing short of impressive. And yet you are able to achier a fresh, fun, contemporary feel to your spaces. How would you describe your creative approach to designing timeless interiors? Thanks, again! This is what I strive to do at all times. I think this happens because i am not fond of trends—i never want to use fabrics, colors, wallcoverings, etc. That are trendy. This is why I love the work of Billy Baldwin, Mark Hampton, David Hicks, Frances Elkins and Sister Parish----their rooms stand the test of time because they ignored trends. Chic high-rises, sprawling vacation retreats - you master them all. Can you share any favorite projects that you look back on and feel they perfectly captured your vision and aesthetic? This is a question I never answer---I love all my projects and hope that they fit my client, not me. Guess i would pick our two houses since they reflect exactly what I like. Our country house is more traditional and our city townhouse is a bit more modern while still comfortable and inviting---two elements that must be present in any project I do. Your book "Glamorous Retreats" offered us insights into vacation homes and hideaways of some of your clients. Designing in various locations offers exciting challenges. What is it about designing secondary residences that you find rewarding? In general, they are lots of fun---clients tend to take more chances with their second or third homes---they always want their second residence to be different from their first. It's fun to have the challenge of making the project appropriate to its environs. How do you recharge and unwind from professional demands? I love to read, watch movies and great cable tv shows which i record---i love bbc mysteries if they are well done---foyle's war is a great example. Writing relaxes and challenges me---i love to write on my mac air on the weekends. The most important thing for me to unwind is to get to our country house at least every two weeks----every week is even better! Travel is a necessary part of your profession. Often there’s the need to be fresh & fabulous as you step off the plane and into a client meeting. Any “must-have” items in your carry-on you could share for keeping chic on the go? I always wear something that will look good when I arrive---in other words, no fabrics that wrinkle easily. I carry makeup essentials in my carry on so that I can freshen up on the plane. I also carry a scarf in my handbag to add to pants and a blazer when i arrive---a trick that all french women use. Dream project… what type of challenge would set your heart on fire if the call came to your studio today? We just got a job for an apartment in new york and have done 2 projects in London, one in Toronto---i would love to get a project in paris. And finally… what can we expect to see next from jan showers? 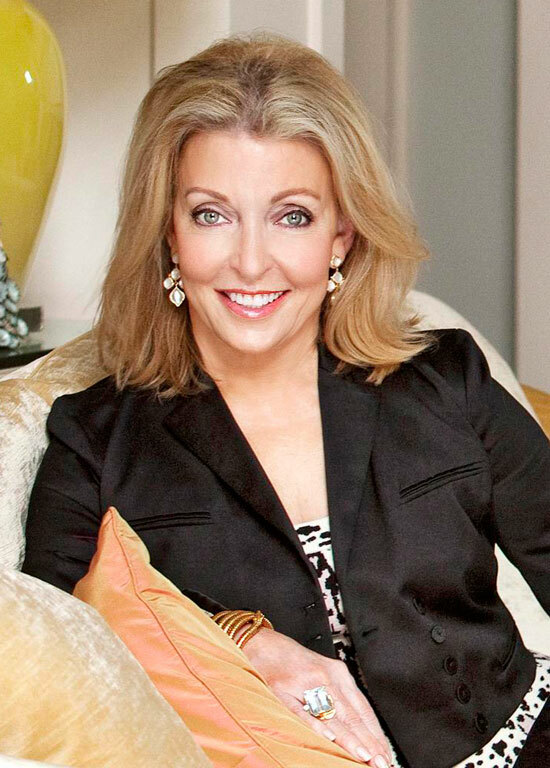 I am doing a wonderful lifestyle line for Kravet Couture that will be introduced in the spring of next year. We have been working on it for well over a year---very exciting. Details to be released later this year. Isn't she just a jewel? Jan is widely regarded as a Texas favorite and Dallas couldn't be more proud to call her their own. If you haven't yet visited her site, I encourage you to take a closer look at her portfolio and designer collections for serious style inspiration. Next, grab Glamorous Rooms and Glamorous Retreats and consider these two critical design books for your private library. Yes, they are gorgeous, but each volume is also filled with fantastic ideas and solid wisdom from the AD100 designer herself. While we're a bit spoiled by our ready access to her furnishings at local showrooms, you too may have a Jan Showers Collection showroom near you. If so, I encourage you to step inside and immerse yourself in her beautiful world of effortless glamour. Consider a sinewy curved sofa. It encourages conversation and lends subtle energy to an otherwise linear floor plan. I can't help it. When I think of Jan my mind immediately imagines stunning sunburst mirrors. Classic, chic and always visually appealing. Set the tone for functional glamour with gilded tables featuring tapered legs and durable marble tops. Form & function align to create small (and incredibly useful) masterpieces. A little reflection is good. A little eglomise? Even better. Place a showstopper like this gold leaf-edged chest on a long wall to make a grand statement without saying a word. Add a bit of verve to shake up a room. This exotic leopard curule seat is a regal as it is feisty. 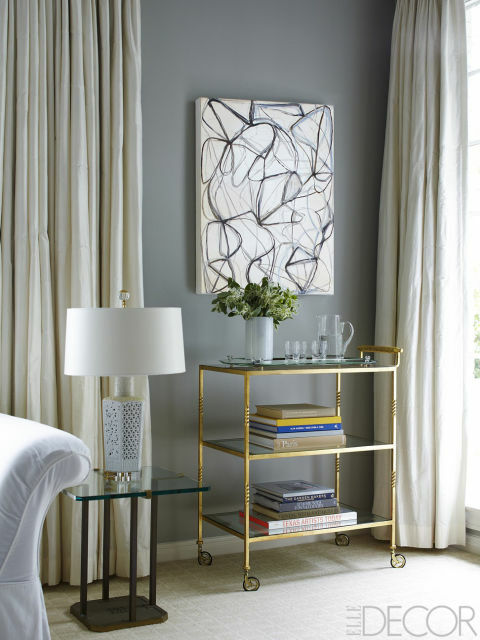 No doubt about it, art sets the tone for a home. Add a cheerful, colorful painting to your walls for an instant mood boost.